It’s been awhile since I posted. I have taken on a new role as an Early Professional Development Manager for the IBM Developer JumpStart program. I am happy to say that I am able to share my passion for accessibility with this new class of early professionals. Here’s one such story. Developer Day is the second day of on boarding for our early professional developers and the start of a two-year learning journey as part of the IBM Developer JumpStart program. April 2017, I attended my first Developer Day at the IBM MassLab in Littleton, MA. I wanted to see what all the excitement was about so I asked the facilitator and master of ceremonies, George Champlin-Scharff-Scarff​, if I could shadow his class and learn a bit more. The day started with a Code Retreat which introduced the developers to the best practices of test-driven development, pair programming and Agile. In the afternoon, the developers were introduced to IBM Design Thinking. They were taken through a set of exercises to build empathy for their end user and develop a minimal viable product (MVP) for a defined business problem: A user is going to the movies and would like to purchase snacks for the movie when ordering tickets online. The developers were given a persona, for example, a teenager, a parent with two kids, a retiree, etc. They were taught how to build empathy for the user by generating an empathy map to capture what the user says, does, feels and thinks. Wait a minute! Something was missing. I approached George and asked him if we ever introduced the developers to accessibility and persons with disabilities. Having spent a 7-year tenure on the IBM Accessibility team, it remains a passion of mine to spread the understanding of what accessibility and inclusive design really means. “Hmm.” George thought this was a great idea. George immediately walked around the room and added a disability to each and every persona. The retiree, he is hard of hearing. The single parent, she has multiple sclerosis. The teenager, he’s blind. “What? How would a blind person enjoy a movie?”, one of the developers asked. We explained that there are many ways someone who cannot see can enjoy a movie. They can hear the dialog. They can feel the sound. They can share the excitement of the audience and audio description devices readily available at many theaters can describe what actions are happening on the big screen. The developers went to work defining their MVPs knowing their users were faced with these physical challenges. George took them through an exercise of how to generate an MVP. The developers created a grid with four quadrants and, using design thinking, generated ideas for solutions and placed them in each of the four quadrants, ranging from low value and difficult implementation to high value and easy implementation. The goal was to find the MVP of the highest value to the user that was easiest to implement. Something magical happened. Across several groups of developers, every group came up with the same exact solution! They all proposed solutions that would allow users to order tickets and snacks at home, and the snacks would be waiting at an assigned seat when they arrived at the theater. Wow! George repeated this activity at several more developer days across several IBM sites. At each developer day, 85-90% of the developers came up with the same MVP. Now, as a program manager for the IBM Developer JumpStart program, I get to attend developer days more often and enjoy them just the same as the first. At a developer day last July, the same thing happened. Seven out of eight teams reached the same MVP. The 8th team had a slight variation with the MVP of having snacks available at the seat in their top quadrant. This activity really demonstrates how when you empathize with your user and include disabilities into personas, you can develop a universal design solution that works for everyone! On Saturday, October 1, 2016, I joined over 100 members of the Boston accessibility community as we descended on the IBM Innovation Center in Cambridge, MA for the 7th annual Boston Accessibility Conference. Participants included some veteran faces and many new ones. Invited by their professor, Dr. Soussan Djamasbi, 40 students from Worcester Polytechnic Institute enjoyed an immersion into the world of accessibility that included panels, workshops and discussions on how to include persons with disabilities into the areas of Information Communication Technology (ICT). The day started off with breakfast and networking followed by a keynote address by Brian MacDonald, President of the National Braille Press. Brian encouraged our continued support and investment in braille literacy, technologies and content while braille has proven to boost the academic achievement and employment rates for blind and low vision (BVI) persons. Of the 26 percent of blind persons who are employed, almost all can read braille. “The correlation is clear – braille is an extremely important tool for blind people to become literate, and it is a critical component that supports educational advancement and increases employment prospects.” – The Need for Braille – National Braille Press. Brian MacDonald, President, National Braille Press delivers keynote address to the Boston Accessibility Conference. Following the keynote address, Sarah Bourne, State of Massachusetts, John Rochford, UMASS Medical School, Jennison Asuncion, LinkedIn and co-founder of Global Accessibility Awareness Day, and John Croston III, founder of Web Accessibility Camps in D.C., led a panel discussion on accessibility. The intent was to provide the newcomers an introduction to accessibility and was attended by the newbies, WPI students. As the panel was taking place, I snuck away to set up for an Inclusive Design Thinking workshop. This left plenty of time for networking at lunch while enjoying a veggie wrap and some of Char James-Tanny’s infamous Vegan Chili. Very spicy! After lunch, my colleague, Erich Manser, and I led the Inclusive Design Thinking workshop. We had 38 participants, a majority of whom were students, new to accessibility. In the workshop, we took the audience through a set of empathy building exercises. We started by asking everyone to design an alarm clock. After 2 minutes, we shared designs and had some pretty interesting ones. One student said they envisioned a ball that would roll off the bureau onto the floor while the alarm went off. This would force him to get up and turn it off. Next, we threw a constraint into the design; the user of the alarm clock is deaf. While most initial designs included audio, this new constraint required creativity and lateral thinking. Many designs involved some sort of touch, vibration and/or light. One participant recommended that the lights would gradually turn on as if the sun were rising. Personally, I always wake up to the smell of coffee. We next passed out a set of low vision simulator goggles and challenged each attendee to take a photo with their phone while wearing the goggles and tweeting it. We had many successful tweets, even one from retired IBM Chief Accessibility Officer, Frances West. We wrapped up the workshop by asking folks to work in groups of 3-4 to create empathy maps that included a persona of a user challenged by a disability and to identify what the person says, thinks, feels and does. The class shared their empathy maps and a common theme arose. Most folks associated frustration with their persona when relating to their challenge while also highlighting their desire to be productive, independent and the best that they can be. WPI students presenting their empathy map to the class. We wrapped up the day with some really cool demos on a joint project between UMASS Medical, UMASS Boston, WPI and IBM to simplify content to improve comprehension by persons challenged with cognitive and learning disabilities, aging persons and just about everyone. Peter Fay, IBM, and Fei Wu, UMASS Boston, demoed how IBM Watson™ language and AlchemyAPI® can be leveraged to create a content clarifier that simplifies text to a 5th or 6th grade reading level. Dr. Soussan Djamasbi showed how her students are conducting eye tracking studies to confirm the improved comprehension when reading the simplified text. This is really cool stuff and Dr. Djamasbi vowed to continue to include accessibility and assistive technology in her curriculum. In closing remarks, Frances West asked the students of WPI what they thought of the future of technology including personalization, aging, speech, text simplification and augmented reality. Frances plans to bring share their feedback at the World Congress on Technology this week in Brazil. I arrived home late Saturday evening exhausted but with much delight. This is one of my favorite events of the year. I get to network with some of the brightest stars in accessibility and share my thoughts and ideas, especially with the next generation of technologists and innovators, on how we can make the world more inclusive to all. Peter Fay introduces Brian MacDonald. John Croston III applauds Braille is Literacy. WPI students try on low vision goggles while planning their empathy map. Sarah Bourne takes the low vision challenge. Samuel Cano, WPI 2016, tries to read his phone wearing low vision goggles. Participant in the Inclusive Design Thinking workshop trying on the low vision goggles. 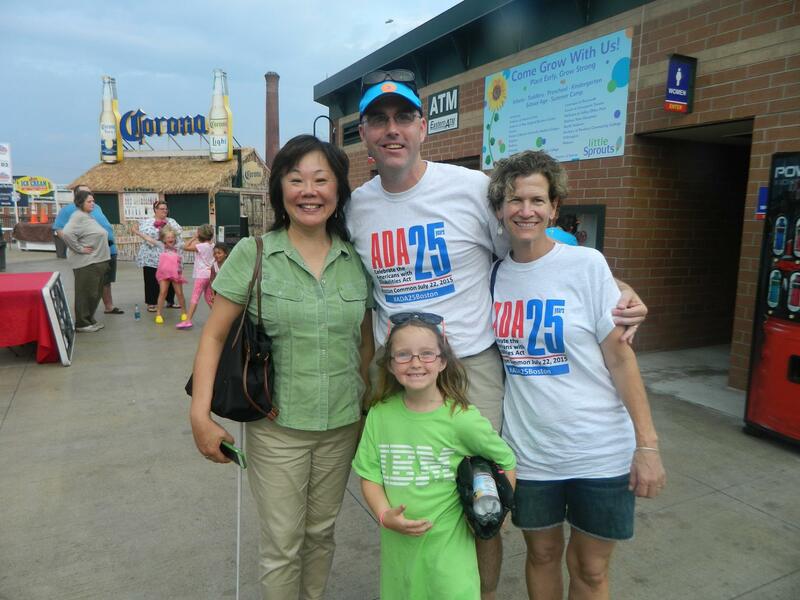 Lowell Spinners Inspiration Night 2015 – Frances West with Erich Manser, Moe Kraft and Erich’s daughter Grace. Today we say good bye to one of IBM’s finest. After 37 years, Frances West, IBM’s Chief Accessibility Officer, is retiring. 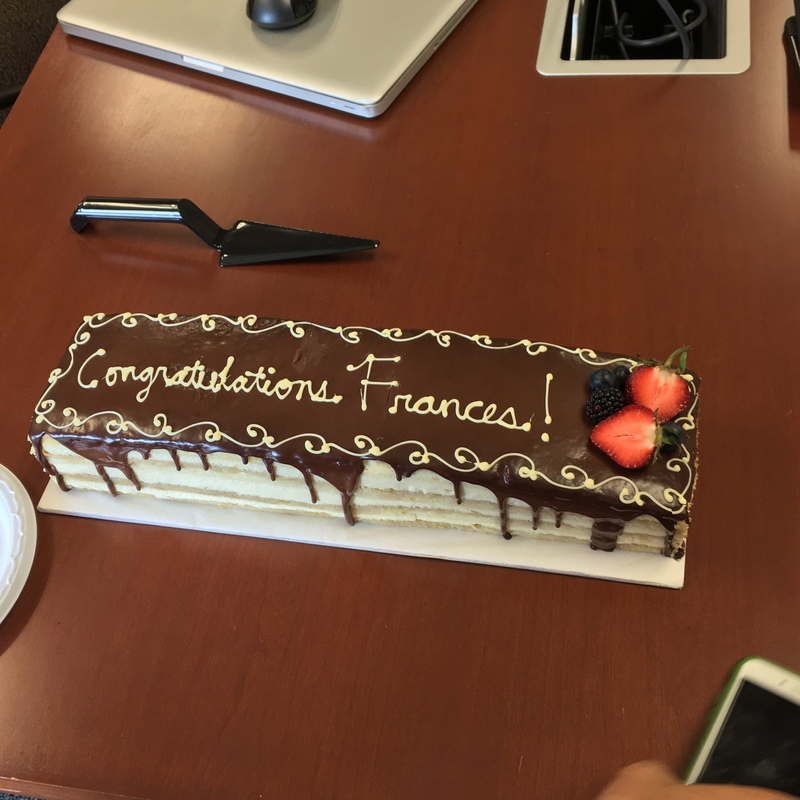 We all thank Frances for her passionate work over the last 12+ years to bring accessibility from compliance to human experience and hyper-personalization that includes everyone; persons with disabilities, the aging demographic, foreign language speakers, those who think and learn differently and mobile workers. Yes, that’s just about all of us. Personally I would like to thank Frances for teaching me to THINK differently. Every time you meet with Frances, your good work is rewarded with more work. Frances pushes you to deliver only your best. She asks, Why are we doing this? Who can we work with? What are they looking for? What is our message? She has taught me that IBM is not a company that just sells products but a company of ideas. Worldwide IBM’s thought leadership and technical eminence are highly regarded by our customers, business partners, academia and greater technical community. We strive to deliver innovation that changes the world. Enjoying layered cake from Flour Bakery in honor of Frances’ retirement. Today we say good bye but I know it is only the beginning of Frances’ next chapter. With her energy, passion and perseverance, you cannot keep Frances down. I am excited to see what she does next. Ralph Waldo Emerson once said “… to know even one life has breathed easier because you have lived. This is to have succeeded.” Frances has changed many lives and made this world a better place for all. Thank you! Congratulations on your retirement from IBM! Format ImagePosted on June 30, 2016 July 1, 2016 Categories Uncategorized8 Comments on Thank you Frances West! Traveling to Rise NYC for the Superheroes vs. Master Hackers Hackaton. As an IBM Accessibility Superhero will mentor coders on adding support for all abilities to their solutions. Many of these new HTML5 sectioning and grouping elements map to the WAI-ARIA Document Structure and Landmark Roles. WAI-ARIA which became a W3C recommendation in March 2014, provides a set of specifications web authors can follow to add markup to improve the accessibility and interoperability of web content and applications. The markup includes roles, states and properties that expose page structure and element states and properties to assistive technologies. Assistive technologies, such as screen readers, can in turn communicate this information to their users providing users with essential information about the elements on the page and the ability to navigate and access those elements. This is pretty exciting to me. Most of WAI-ARIA has been included in the HTML5 specification which became a W3C recommendation in October 2014. The new HTML5 sectioning and grouping elements in particular provide structural information to assistive technologies about the web page or application. For example, a web page may include a banner and search box on top, a main body and footer information with copyright information at the bottom. By properly marking up the page structure with a header, main, footer and section elements along with providing the appropriate WAI-ARIA roles for these elements, a blind user can navigate the page using a screen reader and quickly jump to each of these sections on the page. Although most major browsers support WAI-ARIA, the support for HTML5 accessibility elements is still being worked. The Paciello Group has been tracking this support on the website, HTML5Accessibility. The recommendation today is to continue to use WAI-ARIA roles on the sectioning and grouping elements until the user agents support the native semantics with implied WAI-ARIA roles. The new sectioning and grouping elements may evoke memories of skip to main content and other skip links that assisted the user in navigating to main content and around blocks of content on a web page. As more web authors and user agents adopt HTML5 sectioning and grouping elements along with support for WAI-ARIA landmark and document roles, we can provide a more robust set of navigation techniques. David Todd provides a plugin on GitHub that can be installed into Firefox, giving even non-screen users the ability to navigate landmarks and sections on a web page. So yes. These new sectioning and grouping elements get me excited that web sites and applications can be accessed by a large audience of users including persons with disabilities. Sections and Outlines of an HTML5 Document, Mozilla Developer Network. Let’s be mindful too of another group underrepresented in this story. According to the US Bureau of Labor Statistics, only 17.6 percent of persons with a disability were employed in the United States in 2013[iii]. With assistive technology now so mainstream, it’s time to change these numbers. Let’s include everyone in this opportunity to help close the overall STEM employment gap. One of the fastest growing areas of ICT is Data Analytics. According to the McKinsey Global Institute, demand for deep analytical talent in the U.S. could be 50 to 60 percent greater than its projected supply by 2018 (300,000 projected talent, 440,000-490,000 projected need). [v] That’s just 3 years from now. In July 2010, President Obama signed Executive Order 13548, putting in place practices to hire 100,000 persons with disabilities and measures to retain employees who become disabled during employment. This raises the bar for all employers. Suppose a veteran who is skilled at data analysis becomes injured during service to our country. Wouldn’t you want that same veteran with his or her skills and experience bringing their expertise to the table? By ensuring our data analysis systems are accessible to all, we ensure that the top talent can contribute their ideas and provide the best solutions to keep innovation and our economy moving forward. Screen readers have been available for decades but now are commonplace. They read on-screen content to blind and low vision users, as well as the rest of us, allowing access to data that may previously have required sight or visual acuity. IBM began developing speech recognition applications in the 1950s. Now speech recognition is so advanced, we use it daily to instruct our devices or answer questions on the phone. For people who have a motor disability or injury, speech recognition provides them a pathway to access critical systems to get their jobs done. Captions and transcripts allow people who are deaf or hard of hearing access to education and training and the ability to participate in online meetings. Captions also assist foreign language speakers in understanding content by providing content in a form that is complementary to any audio they may find difficult to follow. In addition to including more persons into the labor force to help fill the gap in STEM disciplines, we need to continue to include our aging workforce as more people are working beyond retirement age. As we age we are faced with challenges in sight, hearing and mobility and yet our knowledge and experiences drive innovation and educate a younger workforce. Assistive technologies along with preferences for large fonts, high contrast and easier access ensures our aging population can continue to be a factor in an innovative and competitive workforce. The trend is clear, with assistive technologies becoming common-place in our daily lives, more of the population has access to essential information, allowing all the best talent to be included in these challenging STEM careers. Let’s continue to be first in innovation and fuel the country’s economy by providing access to information and systems to all including the best and brightest talent for the job. [i] “Rising Above the Gathering Storm, Revisited: Rapidly Approaching Category 5,” National Academies Press, 2010. [ii] “Women and Information Technology by the Numbers,” National Center for Women and Information Technology, 2014. [iii] “PERSONS WITH A DISABILITY: LABOR FORCE CHARACTERISTICS – 2013,” U.S. Bureau of Labor Statistics, 2014. [iv] “HOW TO FIND (AND KEEP) STEM TALENT,”McAward and Raftery, Kelly Services, Inc. 2012. [v] “Big data: The next frontier for innovation, competition, and productivity,” McKinsey Global Institute, 2011. “Technology Talent Initiative,” Massachusetts Department of Higher Education, 2014. “Rising above the gathering storm,” National Academies Gathering Storm committee, National Academies Press, 2010. “Women and Information Technology by the Numbers,” National Center for Women and Information Technology, 2014. “PERSONS WITH A DISABILITY: LABOR FORCE CHARACTERISTICS – 2013,” U.S. Bureau of Labor Statistics, 2014. “How To Find and Keep STEM Talent”, McAward, Tim and Raftery, Megan, Kelly Services, 2012. “STEM: Good Jobs Now and for the Future,” US Department of Commerce, Economics and Statistics Admin, 2011. “Occupational employment projections to 2018,” U.S. Bureau of Labor Statistics, 2010. “Big data: The next frontier for innovation, competition and productivity,” McKinsey Global Institute, May 2011. “The STEM Workforce: An Occupational Overview,” Department for Professional Employees, AFL CIO, May 2012. “Working Beyond Retirement Age –US Census,” Holder, Kelly A. and Clark, Sandra L., U.S. Census Bureau Housing and Household Economics Division Labor Force Statistics Branch, August 2, 2008. “Office Diversity and Civil Rights Newsletter Quarterly e-Newsletter,” US Customs and Border Patrol, February 2011. This blog post is based off a presentation at the Annual International Technology and Persons with Disabilities Conference CSUN Center on Disabilities 2013 by Holly Nielsen and Maureen. For the latest version see Access to Economic Opportunity v1.2. Maureen (Moe) Kraft is a Technical Consultant for IBM Accessibility in IBM Research where she provides education, training and software development techniques to ensure IBM’s assets and products are accessible to people with disabilities. She is an active member of the W3C WCAG Working Group and the Boston a11y group. She received a B.S. in Computer and Information Science from University of Massachusetts, Amherst, MA and has been a software engineer at IBM and Lotus Development for 25 years specializing in accessibility. Learn more about the IBM Accessibility, which works to establish IT accessibility standards, shape government policies, and develop human-centric technology and industry solutions so that all people reach their highest potential in work and life. Join our conversations on Twitter, Facebook, LinkedIn, and Google+.